Winnipeg police have identified two men killed in a shooting at a restaurant early Wednesday in downtown Winnipeg. 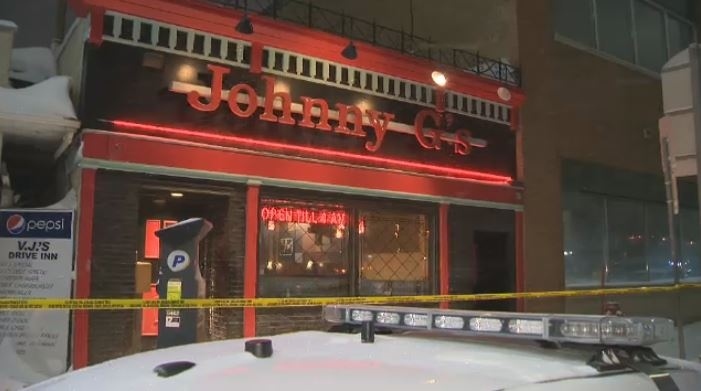 Officers responded to a report of shots fired at Johnny G’s on Main Street at around 1:30 a.m. where two men were located at the restaurant suffering from serious gunshot wounds. Anthony Brian Cromastey, 30, and Rodney Albert Kirton, 25, were taken to hospital in serious condition. Both men died from their injuries. Investigators have determined the men were killed as a result of shooting each other. Police said two handguns were recovered. Officers said Kirton was still alive directly after the shooting when he was allegedly assaulted by a third man. Braedon Lee Gordon, 18, has been charged with assault causing bodily harm. Officers wouldn’t comment on which gang was involved. Court records show Kirton has two previous drug-related convictions and was known by police five years ago as a Mad Cow gang member. Kirton pleaded guilty to possession for the purpose of trafficking on Mar. 18, 2014 when he was 21 and received a 20-month sentence and a lifetime weapons prohibition. During sentencing, court heard Kirton was wanted on outstanding warrants when police located him on Sep. 28, 2014 on Furby Street in a taxi with two other men. Kirton was questioned during sentencing about gang involvement by Judge Kelly Moar. “You may not actually even do anything but at the end of the day you may be at the wrong place at the wrong time,” said Moar. Kirton found himself back in court for another drug trafficking matter on Jul. 31, 2015 when he was sentenced to three years in custody and given a second mandatory lifetime weapons prohibition after pleading guilty to possession for the purpose of trafficking. Court heard officers searched a home on Agnes Street on May 1, 2015 and located the accused who was with his 15-month-old child in the residence. Police also found 20.6 grams of crack cocaine and $6500 in Canadian currency. Kirton’s defence lawyer told court Kirton felt remorseful for what happened. Cromastey was also known to police. Court records indicate Cromastey was convicted in July 2013 and sentenced to 10 days in custody for failing to comply with the conditions of recognizance. During the shooting Wednesday, a restaurant employee suffered a non-life threatening injury during the incident. Police said she was hit by a bullet which had ricocheted. The incident marks the fourth and fifth homicides in Winnipeg in 2019. Four out of the five homicides have involved a gun. The incident happened early morning Wednesday in the area of the restaurant, which is on Main Street between Broadway and York Avenue.